High Throughput Formulation Development of Biopharmaceuticals: Practical Guide to Methods and Applications provides the latest developments and information on the science of stable and safe drug product formulations. 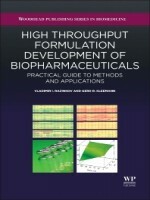 This book presents a comprehensive review and detailed description of modern methodologies in the field of formulation development, a process starting with candidate and pre-formulation screening in its early development phase and then progressing to the refinement of robust formulations during commercialization in the later phases of development. The title covers topics such as experiment design, automation of sample preparation and measurements, high-throughput analytics and stress-inducing methods, statistical analysis of large amounts of formulation study data, emerging technologies, and the presentation of several case studies, along with a concluding summary. It also presents applications of high-throughput methodologies to accelerate drug formulation development and the latest technology in the field and Includes key statistical approaches such as design of experiment and multivariate data analysis Written by highly respected formulation development experts.